The present study examined how the Growth Motivation Index (GMI; Bauer et al. 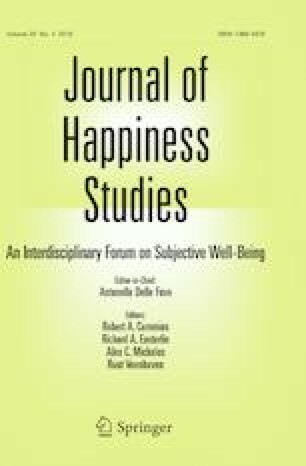 in J Happiness Stud 16:185–210, 2015) related to well-being and identity exploration in samples from the U.S., Japan, Guatemala, and India. The GMI has two facets. GMI-reflective measures the motive to cultivate critical self-reflection and intellectual development, whereas GMI-experiential measures the motive to cultivate personally meaningful activities and relationships. We expected and found that, when comparing the two GMI facets simultaneously, GMI-reflective predicted well-being in countries ranked as having collectivist but not individualist cultures, whereas GMI-experiential predicted well-being in countries ranked as having individualist but not collectivist cultures. GMI-reflective predicted identity exploration across cultures. Implications for growth motivation and culture are discussed. We wish to thank Matt Montoya, Erin O’Mara, Elissa Lauber, Julie Prosser, and Carrie Underwood of the University of Dayton and Claudia DeLeon of Instituto Central America for their help with this project.